A stylish single Art Deco ebonized bridge chair featuring a beech wood frame with an ebony French polish finish beautifully combined with the newly upholstered gray velvet blend. We love the curved lines of the arms, evocative of the Art Deco period. This piece is in excellent vintage condition. The upholstery is new. 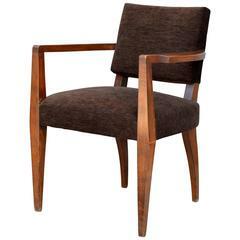 Wonderful French Art Deco period armchair in solid walnut with original leather upholstery. Leather and wood are in good condition. The chair is very strong and comfortable. Chic French Art Deco single bridge armchair. Restored with new brown velvet cover. 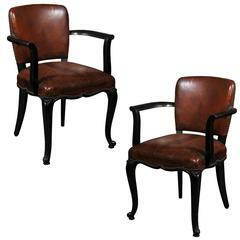 Pair of French “Bridge Chairs” as they are commonly referred to, from the 1930s or 1940s. These are in “as found” condition, so, no restoration work has been done. Priced accordingly. Elegant Art Deco bridge/armchair. Newly upholstered in velvet fabric. Would be perfect in entry or for a desk. Single stylish black upholstered armchair with a uniquely designed maple armrest and side. (Please confirm item location (NY or NJ).